This week I donated my spare Orks to Marquee Models in Harlow. As my local gaming store, I've been dropping in for years, talking nonsense and often leaving without buying much more than a paintbrush or perhaps a pot of paint. So while having a clear out on Sunday and lugging a huge bin bag full of DVDs down to CEX, I thought I'd take along the Orks too and see if Keith wanted to give them a good home. Next thing I knew, they were out of the box and straight into the glorified and spot lit Miniatures Cabinet. 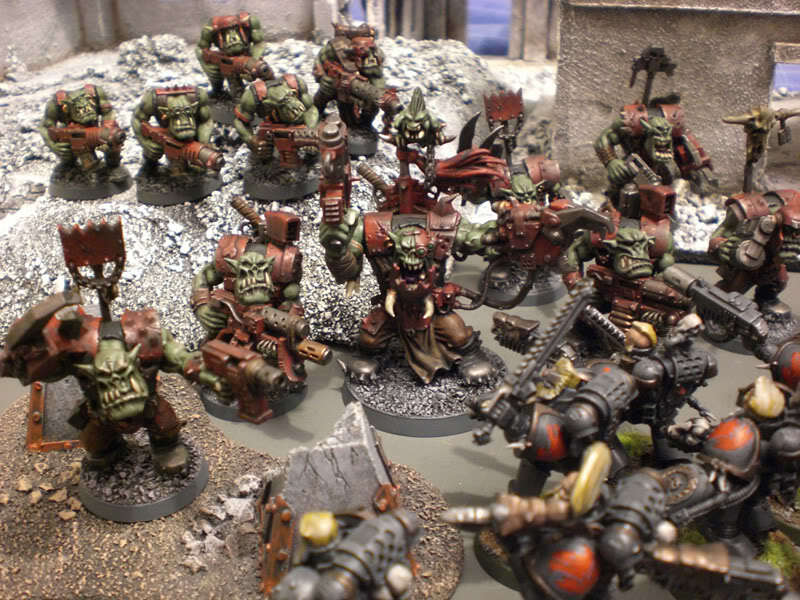 Turns out they desperately needed some Orks for starter games of Warhammer 40K and Keith was fed up with the current set getting butchered by the Space Marines every time. But with these guys all swinging Power Klaws that would be a different story! On a side note, I got £40 for just over 40 DVDs at CEX, which was much better than trying to sell all my second hand goods on eBay. Once you take eBay fees, Paypal fees and postage costs into account, as well as the hassle of packing and posting everything off, driving to my local CEX seems like a great alternative. I was happy to donate the Orks for the same reason. It just seemed so much better to simply give them to a good home. I know they'll be abused by small children learning Warhammer 40K, but what the heck. I applaud you for donating your unused models. It is a good way to help the store teach the younglings. My friend gave me all of his unused Tau models when he found out I was interested in starting. It has really given me a base to work off of and an army big enough to learn to play with. Again, major props for making the sacrifice. I want you to be confident that it was the right action! Mate: what a great thing to do! And thanks for making the hobby a better place. PS: Was it from you that I bought some Tau a couple of years ago, perchance? If they were green with orange stripes, then yes.